This essay, written in 1987, explores the spiritual basis of Friends’ testimony of simplicity: how it evolved from the efforts of early Friends to live in a way that fostered the spiritual richness of their lives, and how it continues to speak today in the lives of those who seek to find not merely “balance,” but an unseamed wholeness of their inward and outward journeys. 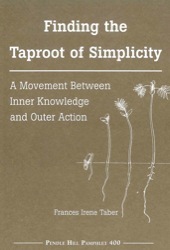 As environmental, economic, and technological events in our times push us with accelerating speed towards fragmentation of ourselves, our lives, and our communities, the “taproot” of simplicity continues to offer us wisdom for building lives of harmony and integrity. Discussion questions included. Frances Irene Taber’s background is in conservative Quakerism in Iowa and Ohio. Fran and Bill Taber were at Pendle Hill for thirteen years. During that time, Fran was a Resident Program student, served on the cooking team, and taught Quakerism with Bill. Fran initiated and for a number of years guided personal retreat opportunities at Pendle Hill. Out of this work came the Pendle Hill pamphlet Come Aside and Rest Awhile (PHP #335, 1997). For ten years Fran was a core teacher in the School of the Spirit ministry. Fran and Bill retired to their home at Barnesville, Ohio. After Bill Taber’s death, Fran married Richard Simon. Fran and Richard live near Olney Friends School at Barnesville and are active in Stillwater Monthly Meeting and Ohio Yearly Meeting.